Thomas started training with Explosive Performance (EP) in 2014 to fulfill his dream of representing the USA in the 2018 Winter Olympics. 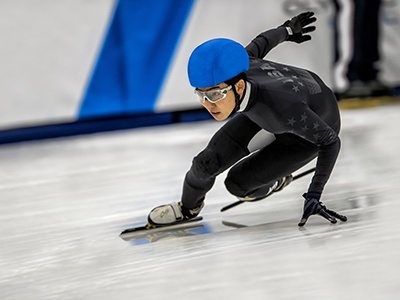 As a result of his dedication to training on and off the ice, and under the expert guidance of his EP trainers, Thomas was able to increase his power, strength, mobility and core to help him set a new World Record in 2016-17 in the 5000-meter speed skating relay and qualify for the 2018 Winter Games in South Korea. Using Olympic lifts and specialized Keiser pneumatic equipment, his training was an integral part of his athletic development. Thomas has had the opportunity to become a champion because of his commitment to all aspects of his athleticism, which led to incremental improvements while staying healthy to train and compete on the international level.